Unfortunately, in today's world many people fail to experience the freedom and healing power of God's grace. Even Christians too often experience judgement, rather than the love that is the vital essence of Christian life. A visionary guide in the spirit of Celebration of Discipline, Embracing the Love of God calls Christians back to the basics -- to understanding the promise of God's love to transform our most important relationships and fulfill our deepest spiritual needs.Here James Bryan Smith launches readers on a revitalizing spiritual journey. He distills the basic principles of Christian love and provides a new model for relationship with God, self, and others that is based not on fear and judgement, but rather on acceptance and care. Smith's moving insights illuminate the gentle nature of God's love and teach readers how to continue on the path of love by embracing it day by day. For both new Christians and those desiring renewal, Embracing the Love of God offers hope, peace, and guidance for spiritual growth. Start reading Embracing the Love of God on your Kindle in under a minute. A visionary guide that calls Christians back to the basics, and to understanding the promise of God's love to transform our most important relationships. Unfortunately, in today's world many people fail to experience the freedom and healing power of God's grace. Even Christians too often experience judgement, rather than the love that is a vital essence of Christian life. A visionary guide in the spirit of Celebration of Discipline, Embracing the Love of God calls Christians back to the basics--to understanding the promise of God's love to transform our most important relationships and fulfill our deepest spiritual needs. Here James Bryan Smith launches readers on a revitalizing spiritual journey. He distills the basic principles of Christian love and provides a new model for relationship with God, self, and others that is based not on fear and judgement, but rather on acceptance and care. Smith's moving insights illuminate the gentle nature of God's love and teach readers how to continue on the path of love by embracing it day by day. For both new Christians and those desiring renewal, Embracing the Love of God offers hope, peace, and guidance for spiritual growth. "The most wonderful thing that can happen to any human being is to be loved. It alone speaks to the gnawing sense of insignificance and isolation we feel. And the marvelous news is that we have been loved and we are loved, each and every one of us. Uniquely and individually. At the heart of the Universe is love, divine love, personal, intimate God-love for you and for me...Once experienced at the deepest levels of the soul, no reality can be more profoundly disturbing, more radically healing, more utterly transforming." --from the foreword by Richard J. Foster. 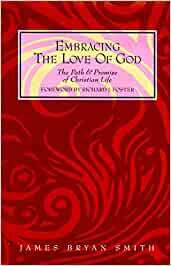 Embracing the Love of God is thought provoking and is,in my opinion, a potential "spiritual classic". Mr. Smith's extended essay is organized around three topics: Knowing God's Acceptance, Receiving God's Forgiveness and Experiencing God's Care. Read it, and keep it to re-read, when you need encouragement. Embracing the Love of God was a blessing to me, and I recommend you buy it. When I went through a time of grief, losing my parents, a sibling, a cousin and two uncles in seven months, this book was always with me. When I couldn't sleep or when I was in a fog, or when I just needed to be reminded of a good God who loved me and would never leave or forsake me, I read over and over about the God who loved me first. When friends are struggling with understanding the love of God, especially in times of darkness or trial, this is often the book that I give as a gift. James Bryan Smith is one of my heroes and I appreciate his honest accounts of his struggle to know the love of God and his joyful understanding that he has come to know. Learning for oneself to know God's love and acceptance and his forgiveness and care are foundational if we want share the love of God with authenticity. This book is a great resource that I return to often. This book help transform me, my ministry as a Chaplain, and countless numbers of clients that I have given this book to. James Bryan Smith is masterful in how he weaves God's love, mercy and grace into our lives of discipleship. So many of my clients deal with incredibly low self-esteem and believe that there is no way God could or would love them after their actions while they were in addiction. This book opens their eyes to a loving and merciful God, and has lifted many of my clients to a new relationship with God and Jesus Christ. I have given about 200 copies of this book away and it truly changes lives. 5.0 out of 5 starsThe focus is on God’s love for us. This is a fantastic book to understand the depth of God’s love for us. So many books focus on our love for God which is also equally important. This one is different because of the focus on God’s love for us. 5.0 out of 5 starsRefresher on Grace. A great yearly read. I read this book yearly as part of a first-year orientation program for a Christian college. Smith beautifully describes the healing power of experiencing God's grace and acceptance, on receiving His forgiveness, and after realizing our status as forgiven and loved people, learning how to better care for ourselves and others. An irresistible challenge to the "I must please God/others so that He/they will love me" mindset.